Then ... The search continues for a new girlfriend for Allan ... Linda thinks an art gallery might be a good place. They visit the West Gallery at the San Francisco Museum of Art, (renamed the San Francisco Museum of Modern Art three years later), which at that time was on the fourth floor of the War Memorial Veteran's Building in the Civic Center (map). ... and Now, the museum has since moved to grander, dedicated quarters; this space is currently occupied by San Francisco Opera's Costume Studio. The wall at left has been opened up and the tall opening to the next gallery at right on the back wall has been partially filled in. 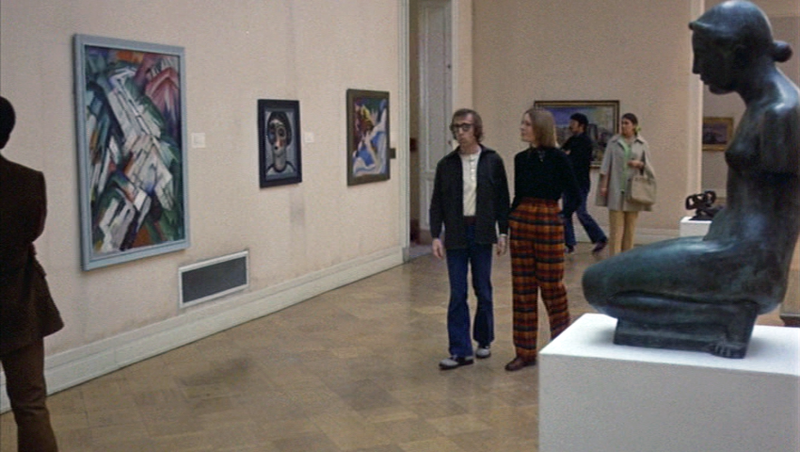 Linda spots a potential candidate (Diana Davila) standing at the end of the gallery in front of the Jackson Pollock painting ‘Guardians of the Secret’; she urges Allan to go over and ask her out. ... and Now, more wall changes are visible in today's matching view. ... a vintage photo ... here's a 1958 photo of the West Gallery taken from the same spot as the shot above. The museum was housed in this and other galleries on the 4th floor of the Veteran's Building from 1935 to 1994 after which it moved to its current home, the Mario Botta designed Museum of Modern Art, on 3rd Street in SoMa.